As the weather warms up, I’ve been starting to drive the ’85 Turbo E30 more. In the “old” days, it was necessary to drag a laptop around to log the MegaSquirt ECU, but thanks to Phil Tobin’s Shadow Logger MS app for Android, it is now possible to connect to the MegaSquirt with your phone! Not only does it log every variable available on the MS, it also adds GPS integration. There is a catch though – your MS must have a bluetooth dongle added to it. I purchased mine on ebay for less than $20 and programmed it to work with the MS. Phil also sells a ready to roll dongle on his site. After you’re done logging, Shadow Logger can upload the log to EFI Analytics’ website so that you can review the log on your desktop computer. Did I mention this is all FREE? Shadow Logger uses a new, compressed log format so it cannot directly be read by MegaLogViewer, but the website does all the necessary processing for you. 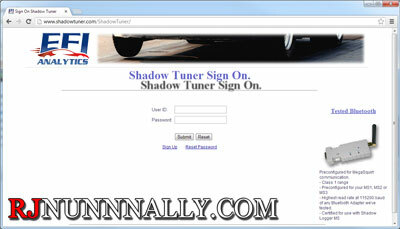 Upload your current TunerStudio tune and Shadow Tuner will convert the log to a MegaLogViewer MSL file automatically. Just press the green download icon and open the file in MegaLogViewer to see the log! Please support Phil and register MegaLogViewer – it’s a great product. Registering also unlocks calculated fields, scatter plots, and a fully functional very of VE Analyze. This is a demo of the scatter plot functionality. Here I have the left side set to GPS X & Y coordinates with it color coded by vehicle speed. 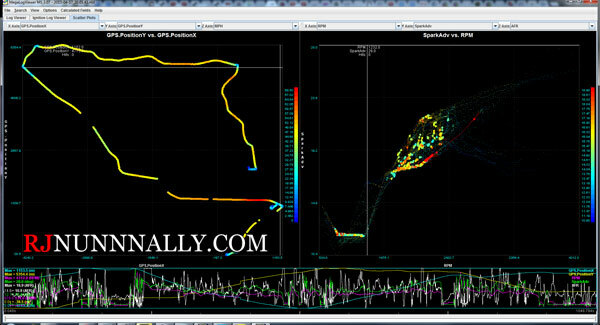 On the right, I plotted Spark Advance vs Engine Speed, color coded by Air/Fuel Ratio. Scatter plots are an easy way to visualize data and find trends that might otherwise be hard to see. This entry was posted in '85 325e, Cars, Smartphone and tagged Android, E30, Logging, MegaLogViewer, Shadow Logger, TunerStudio by RJ. Bookmark the permalink.